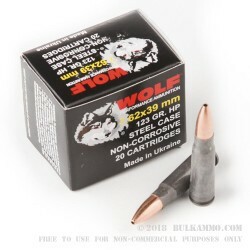 This 7.62x39mm cartridge by WOLF Performance Ammunition sports a 123 grain projectile. 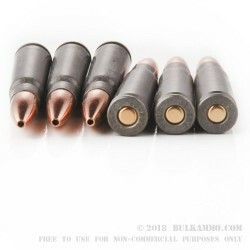 The bullet’s jacket will preserve your bore against rapid lead fouling during target practice so you may fire longer between cleanings, and its hollow point will cause it to expand within soft targets at a range of velocities for devastating takedown damage. This round features a Berdan primed steel casing. It is thus unsuitable for reloading, but its price is attractive enough to dissuade even the most ardent handloaders from engaging in their pastime. Everything about this round is non-corrosive, so you may sit on this tidy box of rounds for several years to come. Rather than Russia, this round is manufactured in Ukraine. 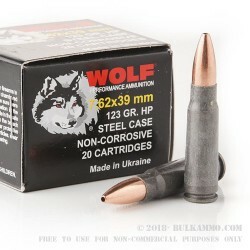 It performs in every way the same as WOLF’s other high quality ammunition, so you can expect to enjoy great performance out of your AK-47 while firing it. 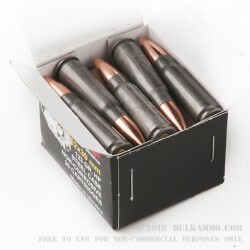 Q: This Wolf 7.62x39 ammo has a BiMetal jacket. But does it have a steel core or lead core? Posted On: 12/22/14 By: Cody B. A: Hello Cody, The Wolf 7.62x39 features a lead core bullet construction.